I have noticed an awful lot of queries about pruning or propagating Roses sent to my site by the search engines. Many gardeners are frightened about Roses and how to deal with them but you should not be because roses are more or less indestructible. It is more important to get the feeding and disease treatments correct. Do you remember when Windows first hit our computers? Soon after the famous range of books starting with 'Computers for Dummies' hit the bookshelves. Well the Dr Hessayon range of books can almost be thought of as 'Gardening for Dummies'. OK maybe that is a bit harsh because us gardeners are sensitive, creative and caring people, right? Seriously, if you are new to roses or just want to be sure about what to do next then this little reference book is a great starting place. It has great clear illustrations and photographs and is written in a no nonsense format. Everything from pruning methods, propagating, including cuttings and grafting, to feeding, disease and parasite control. I am not ashamed to say that we carried these books both in our maintenance vans and also in our office bookshelf for quick reference. It doesn't stop there! Dr Hessayon has produced 115 books in the 'expert' range. 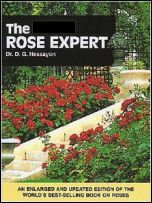 As well as Dr Hessayon's Rose Expert - Other books in the Dr Hessayon series - Lawn Expert, Shrub Expert, Vegetable Expert, Garden DIY Expert. Further reading: How to propagate and root rose cuttings. The world cut flower industry is a highly dynamic industry and Indian companies have now become one among the leading growers and exporters fvarious cut flowers including roses, carnations, gerberas, etc., The origin of production, production techniques, arkets and retailing arrangements are all ndergoing continuous change, challenging the adaptive capacity of the actors involved. In a slowly but steadily growing world market new veloping country exporters are gaining market share at the expense of existing roducers. These producers try to stay ahead by raising productivity and through diversification and innovation to keep their quality standards.